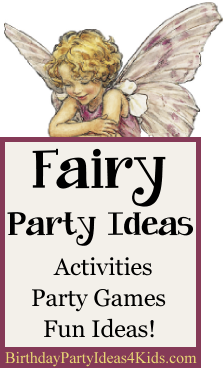 Fairy themed birthday party ideas for kids, tweens, and teens! Let Birthday Party Ideas 4 Kids help you get the party started! Party games, activities, sleepover ideas for boys and girls, over 200 theme party ideas and birthday party themes! Ideas for boys and girls, kids, tweens and teens ages 1, 2, 3, 4, 5, 6, 7, 8, 9, 10, 11, 12, 13, 14, 15, 16, years old!